Don’t let the cold stop you from enjoying a race. Here are five winter races that take place in Scotland. You can read about them in my Sunday Mail outdoors column, or below. As the nights draw in and the temperatures drop, a host of winter races get underway in Scotland. Here’s my pick of five of the best for runners and cyclists. The FoxTrail Running Series is based at Foxlake Adventures wakeboarding park in Dunbar, East Lothian. 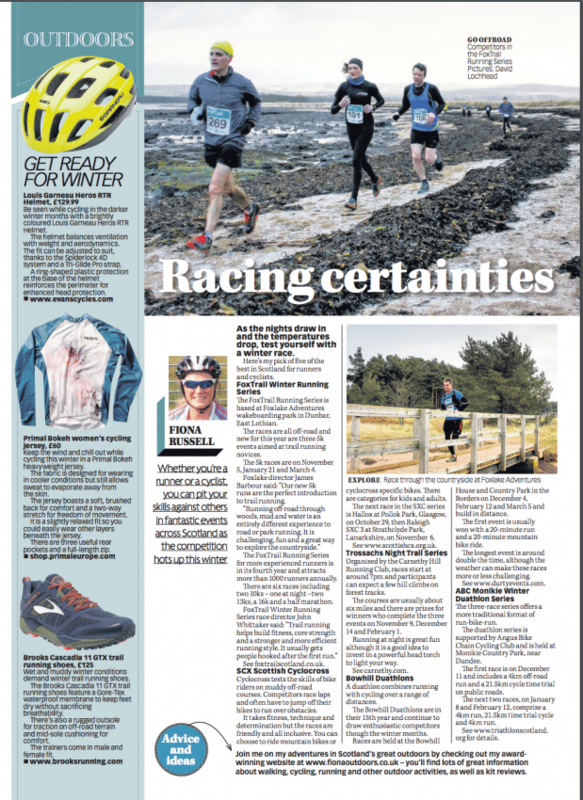 The races are all off-road and new for this year are three 5k events aimed at trail running novices. The 5k races take place on November 5, January 21 and March 4. James Barbour, director at Foxlake, said: “Our new 5k runs are the perfect introduction to trail running for people of all abilities. An established FoxTrail Running Series for more experienced runners is now in its fourth year and attracts more than 1000 runners annually. There are six races including two 10ks, one at night, two 13ks, a 16k and a half marathon. John Whittaker, FoxTrail Winter Running Series race director, said: “Trail running helps build fitness, core strength and a stronger and more efficient running style. Cyclocross is a sport that tests the skills of riders on muddy off-road courses. Riders race laps and are often required to jump off their bikes to run over obstacles. Fitness, technique and determination go hand in hand but above all these races are known for being friendly and all inclusive. You can choose to ride mountain bikes of cyclocross specific bikes. There are age categories for kids and adults. The next race in the SXC series is Plean XC on November 27. A series of night-time trail races takes place on Wednesday nights in winter in the Trossachs. Organised by the Carnethy Hill Running Club, there are three races that start at around 7pm and participants can expect a few hill climbs on forest tracks. The races are enjoyed by all types of runners, from experienced racing whippets to trail running new-comers. The courses are usually around 6 miles long and there are prizes for winners who complete the three events on November 9, December 14 and February 1. Running at night is great fun although it is a good idea to invest in a powerful head torch to light your way. A duathlon combines running with cycling over a range of distances. The Bowhill Duathlons are in their 15th year and continue to draw enthusiastic competitors though the winter months. The races take place at the Bowhill House and Country Park in the Borders on December 4, February 12 and March 5 and build in distance. The shorter first event is usually won with a 20-minute run and a 20-minute mountain bike ride. The longest event is around double the time although the weather can make these races more or less challenging. The three-race series offers a more traditional format of run-bike-run and on roads rather than mountain bike trails. The duathlon series is supported by Angus Bike Chain Cycling Club and takes places at Monikie Country Park, near Dundee. The first race is on December 11 and includes a 4km off-road run and a 21.5km cycle time trial on public roads. The next two races, on January 8 and February 12, 2017, comprise a 4km run, 21.5km time trial cycle and 4km run.